Calculate the impedance, phase angle, resonant frequency, power, power factor, voltage, and/or current in a RLC series circuit. Draw the circuit diagram for an RLC series circuit. Explain the significance of the resonant frequency. When alone in an AC circuit, inductors, capacitors, and resistors all impede current. How do they behave when all three occur together? Interestingly, their individual resistances in ohms do not simply add. Because inductors and capacitors behave in opposite ways, they partially to totally cancel each other’s effect. Figure 1 shows an RLC series circuit with an AC voltage source, the behavior of which is the subject of this section. The crux of the analysis of an RLC circuit is the frequency dependence of and , and the effect they have on the phase of voltage versus current (established in the preceding section). These give rise to the frequency dependence of the circuit, with important “resonance” features that are the basis of many applications, such as radio tuners. Figure 1. An RLC series circuit with an AC voltage source. Here is the peak current, the peak source voltage, and is the impedance of the circuit. The units of impedance are ohms, and its effect on the circuit is as you might expect: the greater the impedance, the smaller the current. To get an expression for in terms of , , and , we will now examine how the voltages across the various components are related to the source voltage. Those voltages are labeled , , and in Figure 1. Conservation of charge requires current to be the same in each part of the circuit at all times, so that we can say the currents in , , and are equal and in phase. But we know from the preceding section that the voltage across the inductor leads the current by one-fourth of a cycle, the voltage across the capacitor follows the current by one-fourth of a cycle, and the voltage across the resistor is exactly in phase with the current. Figure 2 shows these relationships in one graph, as well as showing the total voltage around the circuit , where all four voltages are the instantaneous values. According to Kirchhoff’s loop rule, the total voltage around the circuit VV is also the voltage of the source. which is the impedance of an RLC series AC circuit. For circuits without a resistor, take ; for those without an inductor, take ; and for those without a capacitor, take . Figure 2. This graph shows the relationships of the voltages in an RLC circuit to the current. The voltages across the circuit elements add to equal the voltage of the source, which is seen to be out of phase with the current. An RLC series circuit has a resistor, a 3.00 mH inductor, and a capacitor. (a) Find the circuit’s impedance at 60.0 Hz and 10.0 kHz, noting that these frequencies and the values for and are the same as in Chapter 23.11 Example 1 and Chapter 23.11 Example 2. (b) If the voltage source has , what is at each frequency? For each frequency, we use to find the impedance and then Ohm’s law to find current. We can take advantage of the results of the previous two examples rather than calculate the reactances again. In both cases, the result is nearly the same as the largest value, and the impedance is definitely not the sum of the individual values. It is clear that dominates at high frequency and dominates at low frequency. The current at 60.0 Hz is the same (to three digits) as found for the capacitor alone in Example 1. The capacitor dominates at low frequency. The current at 10.0 kHz is only slightly different from that found for the inductor alone in Chapter 23.11 Example 1. The inductor dominates at high frequency. where is the resonant frequency of an RLC series circuit. This is also the natural frequency at which the circuit would oscillate if not driven by the voltage source. At , the effects of the inductor and capacitor cancel, so that , and is a maximum. 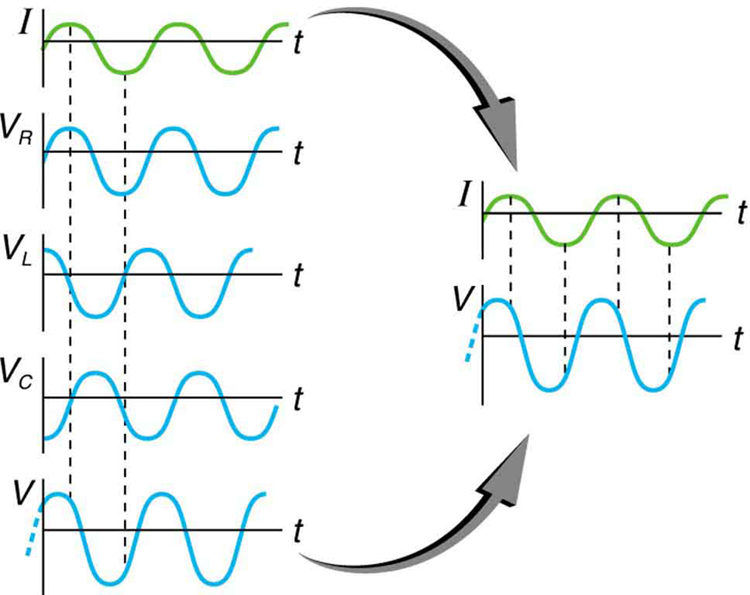 Resonance in AC circuits is analogous to mechanical resonance, where resonance is defined to be a forced oscillation—in this case, forced by the voltage source—at the natural frequency of the system. The receiver in a radio is an RLC circuit that oscillates best at its . A variable capacitor is often used to adjust to receive a desired frequency and to reject others. Figure 3 is a graph of current as a function of frequency, illustrating a resonant peak in at . The two curves are for two different circuits, which differ only in the amount of resistance in them. The peak is lower and broader for the higher-resistance circuit. Thus the higher-resistance circuit does not resonate as strongly and would not be as selective in a radio receiver, for example. Figure 3. 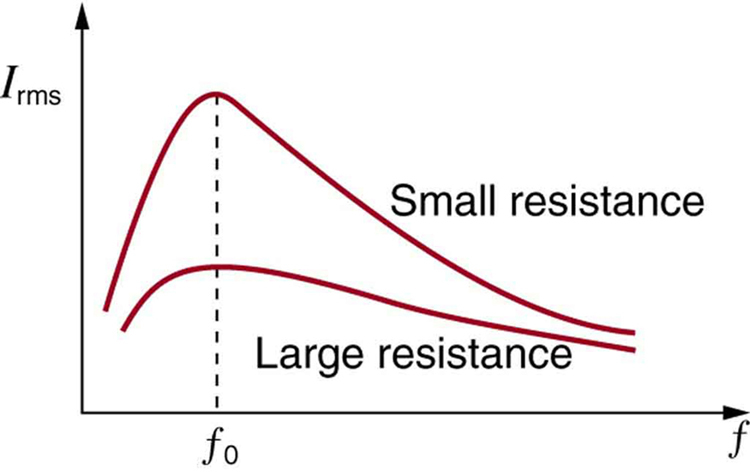 A graph of current versus frequency for two RLC series circuits differing only in the amount of resistance. Both have a resonance at f0, but that for the higher resistance is lower and broader. The driving AC voltage source has a fixed amplitude V0. For the same RLC series circuit having a resistor, a 3.00 mH inductor, and a capacitor: (a) Find the resonant frequency. (b) Calculate at resonance if is 120 V.
The resonant frequency is found by using the expression in . The current at that frequency is the same as if the resistor alone were in the circuit. We see that the resonant frequency is between 60.0 Hz and 10.0 kHz, the two frequencies chosen in earlier examples. This was to be expected, since the capacitor dominated at the low frequency and the inductor dominated at the high frequency. Their effects are the same at this intermediate frequency. Thus is called the power factor, which can range from 0 to 1. Power factors near 1 are desirable when designing an efficient motor, for example. At the resonant frequency, . For the same RLC series circuit having a resistor, a 3.00 mH inductor, a capacitor, and a voltage source with a of 120 V: (a) Calculate the power factor and phase angle for . (b) What is the average power at 50.0 Hz? (c) Find the average power at the circuit’s resonant frequency. The phase angle is close to , consistent with the fact that the capacitor dominates the circuit at this low frequency (a pure RC circuit has its voltage and current out of phase). Power delivered to an RLC series AC circuit is dissipated by the resistance alone. The inductor and capacitor have energy input and output but do not dissipate it out of the circuit. Rather they transfer energy back and forth to one another, with the resistor dissipating exactly what the voltage source puts into the circuit. This assumes no significant electromagnetic radiation from the inductor and capacitor, such as radio waves. Such radiation can happen and may even be desired, as we will see in the next chapter on electromagnetic radiation, but it can also be suppressed as is the case in this chapter. The circuit is analogous to the wheel of a car driven over a corrugated road as shown in Figure 4. The regularly spaced bumps in the road are analogous to the voltage source, driving the wheel up and down. The shock absorber is analogous to the resistance damping and limiting the amplitude of the oscillation. Energy within the system goes back and forth between kinetic (analogous to maximum current, and energy stored in an inductor) and potential energy stored in the car spring (analogous to no current, and energy stored in the electric field of a capacitor). The amplitude of the wheels’ motion is a maximum if the bumps in the road are hit at the resonant frequency. Figure 4. 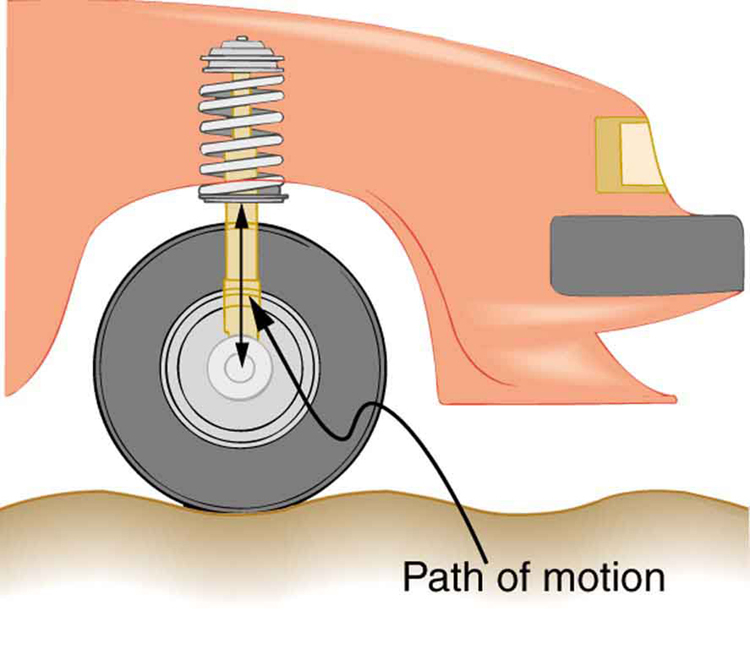 The forced but damped motion of the wheel on the car spring is analogous to an RLC series AC circuit. The shock absorber damps the motion and dissipates energy, analogous to the resistance in an RLC circuit. The mass and spring determine the resonant frequency. 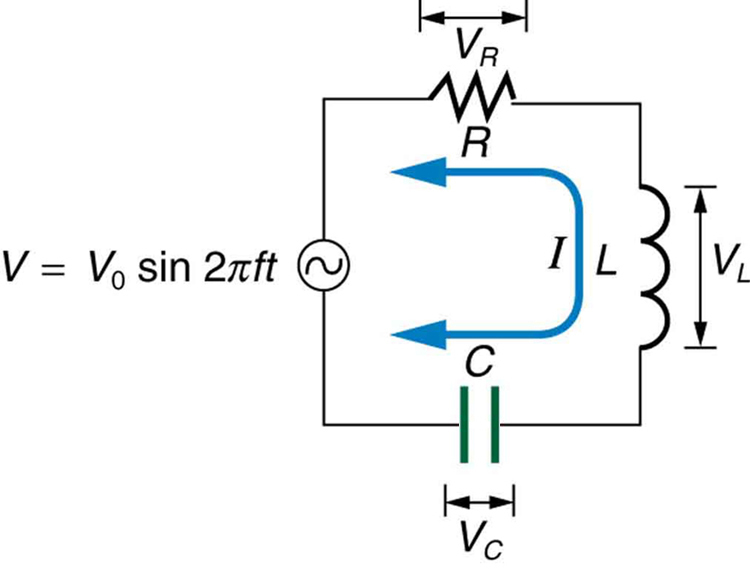 A pure LC circuit with negligible resistance oscillates at , the same resonant frequency as an RLC circuit. It can serve as a frequency standard or clock circuit—for example, in a digital wristwatch. With a very small resistance, only a very small energy input is necessary to maintain the oscillations. The circuit is analogous to a car with no shock absorbers. Once it starts oscillating, it continues at its natural frequency for some time. 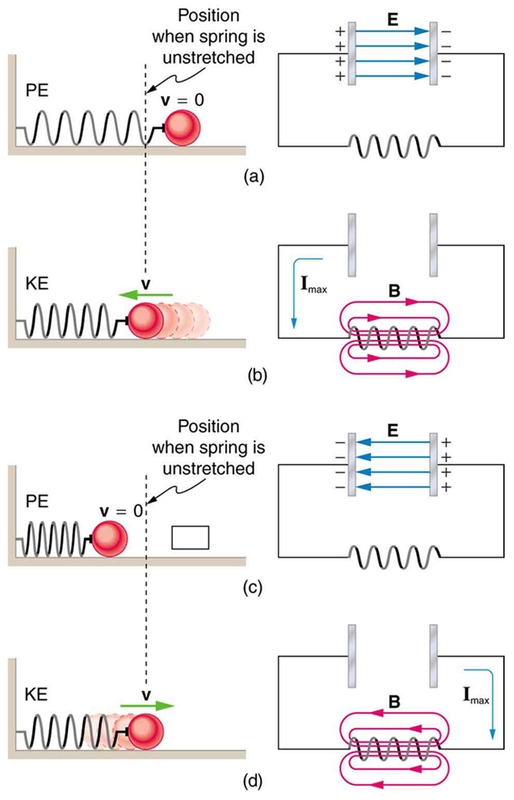 Figure 5 shows the analogy between an LC circuit and a mass on a spring. Figure 5. An LC circuit is analogous to a mass oscillating on a spring with no friction and no driving force. Energy moves back and forth between the inductor and capacitor, just as it moves from kinetic to potential in the mass-spring system. where is the peak current and is the peak source voltage. Impedance has units of ohms and is given by . for a purely resistive circuit or an RLC circuit at resonance. is called the power factor, which ranges from 0 to 1. 1: Does the resonant frequency of an AC circuit depend on the peak voltage of the AC source? Explain why or why not. 2: Suppose you have a motor with a power factor significantly less than 1. Explain why it would be better to improve the power factor as a method of improving the motor’s output, rather than to increase the voltage input. 1: An RL circuit consists of a resistor and a 3.00 mH inductor. (a) Find its impedance at 60.0 Hz and 10.0 kHz. (b) Compare these values of with those found in Example 1 in which there was also a capacitor. 2: An RC circuit consists of a resistor and a capacitor. (a) Find its impedance at 60.0 Hz and 10.0 kHz. (b) Compare these values of with those found in Example 1, in which there was also an inductor. 3: An LC circuit consists of a inductor and a capacitor. (a) Find its impedance at 60.0 Hz and 10.0 kHz. (b) Compare these values of with those found in Example 1 in which there was also a resistor. 4: What is the resonant frequency of a 0.500 mH inductor connected to a capacitor? 5: To receive AM radio, you want an RLC circuit that can be made to resonate at any frequency between 500 and 1650 kHz. This is accomplished with a fixed inductor connected to a variable capacitor. What range of capacitance is needed? 6: Suppose you have a supply of inductors ranging from 1.00 nH to 10.0 H, and capacitors ranging from 1.00 pF to 0.100 F. What is the range of resonant frequencies that can be achieved from combinations of a single inductor and a single capacitor? 7: What capacitance do you need to produce a resonant frequency of 1.00 GHz, when using an 8.00 nH inductor? 8: What inductance do you need to produce a resonant frequency of 60.0 Hz, when using a 2.00 μF2.00 μF capacitor? 9: The lowest frequency in the FM radio band is 88.0 MHz. (a) What inductance is needed to produce this resonant frequency if it is connected to a 2.50 pF capacitor? (b) The capacitor is variable, to allow the resonant frequency to be adjusted to as high as 108 MHz. What must the capacitance be at this frequency? 10: An RLC series circuit has a resistor, a inductor, and an capacitor. (a) Find the circuit’s impedance at 120 Hz. (b) Find the circuit’s impedance at 5.00 kHz. (c) If the voltage source has , what is at each frequency? (d) What is the resonant frequency of the circuit? (e) What is at resonance? 11: An RLC series circuit has a resistor, a inductor, and a 25.0 nF capacitor. (a) Find the circuit’s impedance at 500 Hz. (b) Find the circuit’s impedance at 7.50 kHz. (c) If the voltage source has , what is at each frequency? (d) What is the resonant frequency of the circuit? (e) What is at resonance? 12: An RLC series circuit has a resistor, a inductor, and an capacitor. (a) Find the power factor at . (b) What is the phase angle at 120 Hz? (c) What is the average power at 120 Hz? (d) Find the average power at the circuit’s resonant frequency. 13: An RLC series circuit has a resistor, a inductor, and a 25.0 nF capacitor. (a) Find the power factor at . (b) What is the phase angle at this frequency? (c) What is the average power at this frequency? (d) Find the average power at the circuit’s resonant frequency. 14: An RLC series circuit has a resistor and a 25.0 mH inductor. At 8000 Hz, the phase angle is . (a) What is the impedance? (b) Find the circuit’s capacitance. (c) If is applied, what is the average power supplied? 15: Referring to Example 3, find the average power at 10.0 kHz. (b) At 60 Hz, with a capacitor, , over 13 times as high as without the capacitor. The capacitor makes a large difference at low frequencies. At 10 kHz, with a capacitor , about the same as without the capacitor. The capacitor has a smaller effect at high frequencies. (b) These values are close to those obtained in Example 1 because at low frequency the capacitor dominates and at high frequency the inductor dominates. So in both cases the resistor makes little contribution to the total impedance. 23.12 RLC Series AC Circuits by OpenStax is licensed under a Creative Commons Attribution 4.0 International License, except where otherwise noted.